P.S. If you haven’t entered the Fashionsquad.com + Rebecca Minkoff giveaway yet, then what are you waiting for?! 12 lucky readers will win an awesome BF bag from Minkoffs resort collection, go go go! ZARA coat (old). ZARA pants. TOPSHOP shawl (old). DIN SKO shoes. REBECCA MINKOFF bag. This entry was posted in Outfit and tagged fashion blog, Outfit, Topshop, Zara by Carolina Engman. Bookmark the permalink. Carolina can you please tell me what’s the fit in your nowhere dress? Ooh love that bag! Gorgeous!!! Red/black suits you big time! I am in love with the red shawl! It looks so beautiful on you! And the Rebecca Minkoff bag, omg! 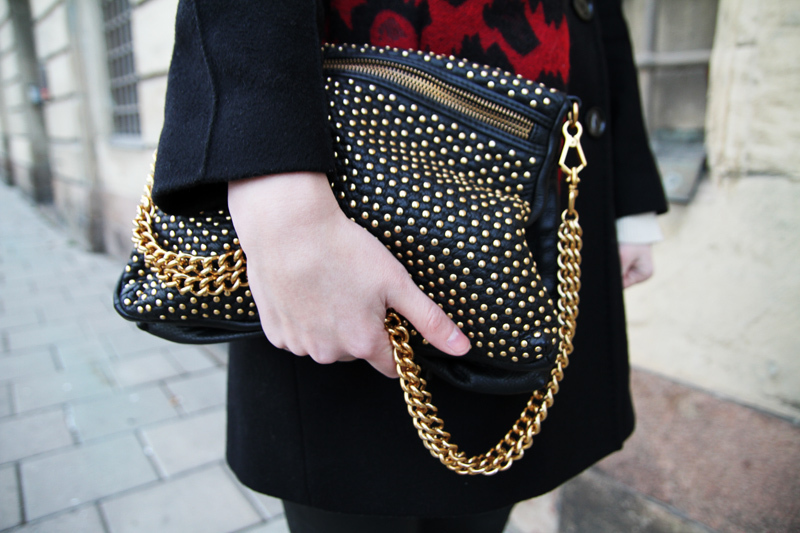 Gold studs are so awesome! Fabulous look! You look so pretty with that look. I hope you had a great day and I cant wait to see what you got for your self. Its amazing what a difference a pop of colour like that scarf can make! That scarf is gorgeous – you look amazing in red! I also wanted to say that you have a beautiful smile! this scarf really makes outfit! love it! btw, just wanted to ask if you satisfied with guality of Din Sco`s shoes? I like their designs there are can be quite fancy ones, but I got impression that guality of them is not good.. what do u think? that scarf is really nice. Beautiful shawl and amazing bag! nice outfit, love the purse! Great outfit. Love your scarf and shoes! So great, as usual !!! You look so much better when you smile !!! So cute. I love your pic walking. you look fantastic and so so fierce! love the scarf, it looks amazing! Hi Carolina! The caligo one, that you wear under tshirts and shirts. Love the red scarf. This outfit is gorgeous on you. aww such a beautiful outfit! i love it!!! Really beautiful photos and a gorgeous outfit! Another outfit that I truly, madly, deeply like! Umm I love these pants. Do you know if these particular ones are still there?? This look is so chic! Adore! gorgeous bag! adore the red leopard print as well! GREAT OUTFIT!!! I love your shoes a lot! Omg that bag is gorgeous!!! i love the bag, amazing!! So chic, yet again! 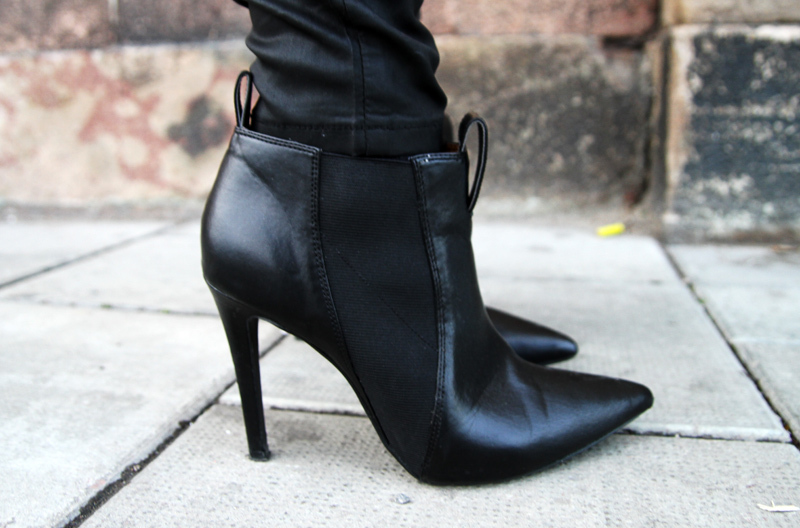 The boots, the bag, the trousers are all so lovely and the scarf is the perfect accessory to go with it all! Love the combination of black, red and gold -there are contrasts, but they are not too sharp. It’s absolutely great, that you spice up that super simple outfit with these lovely accessoires. Simply gorgeous! nice scarf and shoes ! Beautiful as usual. Love your bag. Loving the black and red scarf! I love the shawl and bag, absolutely gorgeous! Caroline! I love the red scarf and Isabel Marant-inspired boots. This color will look amazing on you! I can’t wait to see it with the white leather skirt! I am in love with the bag! love this outfit ! simple and fun as well ! love the shawl !